WordPress is one of the most flexible and widely used content management systems and offers a lot of flexibility and power. It makes it easier for users to create beautiful websites and extends functionality through thousands of plugins. However, a successful website isn’t just about site design or content as optimizing it for search engines is also vital. Although there is no shortage of WordPress SEO guides, most of them are way too difficult for beginners to understand. This post primarily aims to make it easier for new users to optimize their websites for search engines, which is crucial for attracting more traffic. Let’s start with the basics before getting into details about how to optimize WordPress websites for better search engine visibility and ranking. Unlike Mathematics, Physics and other science subjects, SEO is not based on hard-and-fast rules as search engines keep updating their search algorithms. All we have are general guide lines and best practices that apply to all almost search engines. If done properly, SEO can prove to be the backbone of a successful website and is especially important for online and small businesses that want better exposure. SEO encompasses strategies and tactics that help make a website more appealing to search engines, especially Google. More ‘appealing’ means search engines consider a website to have more relevant and valuable content. We expect relevant and informative websites at the top when we search for a particular keyword. Although SEO does not guarantee top spot in organic search rankings, it does help in generating more site traffic and improved search engine rankings. SEO is not just about the home page or some other important pages and should encompass the whole website. It does not take long for SEO to become complicated and technical, but the basics are fairly easy to understand and even beginners can set most of the things straight. SEO certainly does not mean tricking the search engines for a higher ranking. SEO is more about offering useful content, formatting it properly and letting the search engines know what’s on offer. The reason we need to focus on SEO is that search engine algorithms are not perfect and they need our help to properly understand what our content is about and how it’s useful for the reader. While you may have very useful content to offer, people may not be able to find it through search engines if it isn’t optimized. SEO is more like a game we play with search engines. You have to follow certain rules and be smart while playing the game. Search engines keep changing rules of the game so you also need to adjust accordingly unless you have some unique content not available anywhere (which is most probably not the case). You may be able to cheat the system for a while, but in the long run, it just won’t work. SEO is not something that can change things overnight as it may take months or even years for the results to show. Here are some of the important Dos and Don’ts that also apply to content management systems other than WordPress. Experts consider WordPress to be a more search engine friendly CMS than most other platforms, which is one of the reasons people prefer WP. The reason is quite simple, WordPress generates code that adheres to the SEO best practices. But there is a lot more you can do to optimize your blog or site to generate more traffic. Although SEO can get quite technical, most of the stuff does not require you to be a tech-genius. 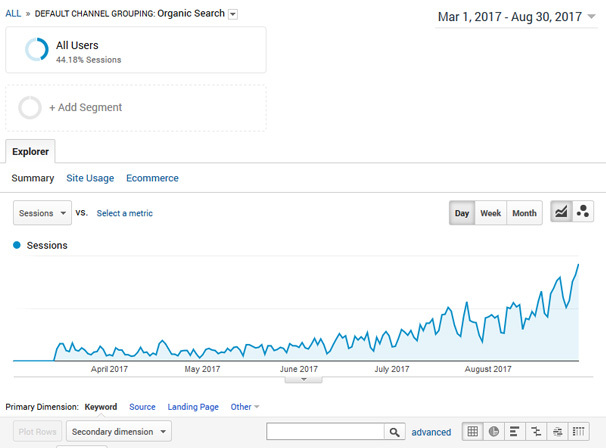 Following some basic principles and SEO best practices can potentially mean a significant boost in site traffic, but you need to stay patient and keep focused. Although the guidelines discussed here are WordPress-focused, they also apply to other platforms with slight variations. In most cases you’d want your website to be discoverable by search engines, that’s why you need to ensure that the ‘Search Engine Visibility’ option is enabled in WordPress. The option is basically there to hide a website from search engines during the development stages and can be accessed by going to Settings and then Reading tab. Make sure to Save Settings before leaving the page. SEO-friendly URLs contain the most important keywords that describe the actual content and are easy to read by us and the search engines. For example, if you are writing a post about how to install Windows on a Mac, a SEO-friendly URL should be something like http://yoursite.com/install-Windows-on-Mac. Such URLs help readers understand what the content is about, while also making it easier for search engines to determine the relevancy of the content. 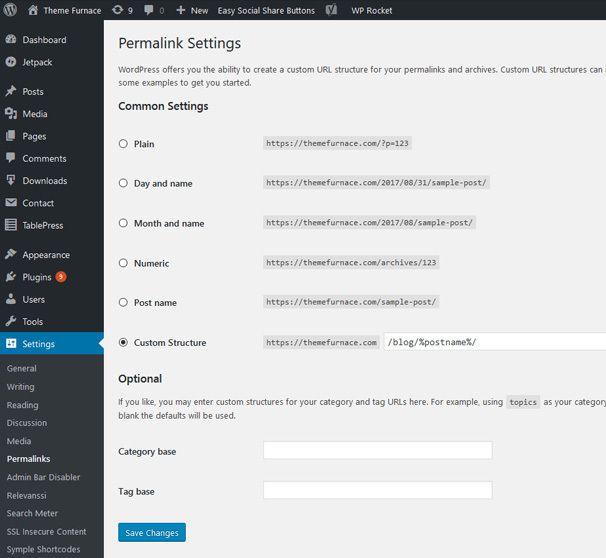 WordPress makes it easier for users to name pages and comes with a built-in Permalinks feature accessible from Settings -> Permalinks. There are many options available, including post name by date and name and by month and name. Enabling Permalinks to name posts by ‘Post name’ is the recommended option as it ensures that the URL contains important keywords that make it easier for both humans and search engines to guess what the content is about. However, sites older than six months should avoid changing the permalink structure (unless the number option was being used) as this would result in losing the existing search engine ranking as well as social media share count. Beginners and nontechnical users are recommended to hire services of a professional developer if they need to change the permalink structure to ensure that proper setup of redirects. Search engines consider www and non-www sites as different even if they are actually the same. For example, search engines would differentiate between http://www.yoursite.com and http://yoursite.com. 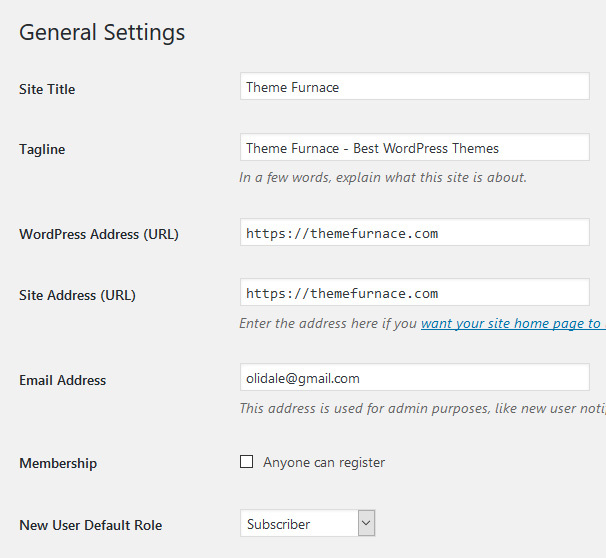 When starting up with a website, set the preferences @ Settings -> General and add a preferred URL in both fields (WordPress Address and Site Address). There is no proven real-world advantage of using one type over another, but once you select an option, stick to it. One of the main reasons WordPress is so powerful and flexible is the availability of thousands of plugins that extend functionality and make it easier for users to automate tasks. 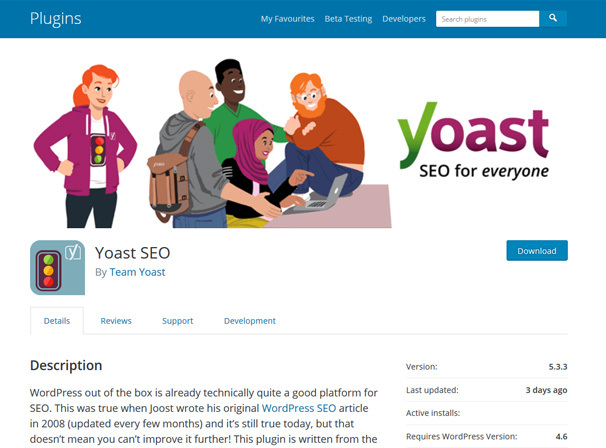 Although there are many SEO plugins available, Yoast SEO is the most popular and functional plugin and the only one we would recommend you to use. This plugins make it easier to manage SEO and notify if anything is not in-line with the SEO best practices. There is a premium version of Yoast SEO which cost 79euros per year, but honestly the free version will be fine for 90% of people’s needs. XML sitemap is meant to be consumed by search engines and lists all the pages of a website in a file specially formatted for the purpose. Although the XML sitemap does not help boost search ranking, it increases the probability of search engines finding the pages more quickly. 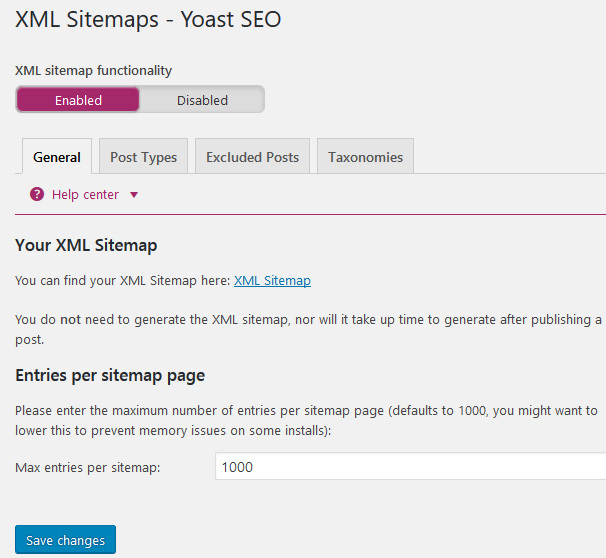 Yoast SEO automatically generates the XML Sitemap, which is accessible @ http://yoursite.com/sitemap_index.xml (you can also use other methods to generate the XML sitemap). Also, make sure to submit the sitemap link to Google Webmaster Tools. Google Webmaster tools aka Search Console is offered by Google and allows site owners to analyze how Google sees the content. The console not only offers actionable reports, but also helps site owners understand how pages appear in the organic search results. The tools make it easier to discover the keywords visitors are using to find your website and help understand the strategies that are working and vice versa. The console also notifies if it detects something wrong with your website such as crawlers unable to access the website. You can submit XML sitemap in the console by going to the crawl menu and clicking Sitemaps. Comments indicate how engaging a post is, but spam comments are also common and can hurt the reputation of your website. Spam comments are often accompanied by bad links that can negatively affect the search rankings, which makes combating spam comments crucial. There are different ways to handle comment spam, including using Akismet that comes baked-in with WordPress sites. If your website attracts a lot of comments, you can split them into multi pages to avoid slow page loading (Settings -> Discussion -> Break Comments…). A WordPress SEO plugin in most cases is not enough and there is more to SEO, including optimizing the blog posts. On-page optimization is equally important and includes carefully choosing focus keywords, writing SEO-friendly titles, writing good meta descriptions, creating categories and tags and internal linking. Chances are great that your posts also contain images, which makes it important to optimize them as search engines put a lot of emphasis on the alt-attribute. The alt tags tell search engines what the images are about and help increase the overall ranking of the page. WordPress automatically applies the alt attributes based on the file-name. It’s highly recommended to name the image files according to their content and let WordPress do the rest. Every month thousands of websites get hacked and intruders inject malware and phishing code into the affected sites. Search engines black list such sites and don’t allow them to show up in search results altogether. Failing to ensure the security of your WordPress site leaves it vulnerable to intruders and can destroy all the hard work in no time. One of the basic steps you can take to enhance WordPress site security is to start using SSL/HTTPS. Secure Sockets Layer encrypts the connection between a user (browser) and the server and provides an extra layer of security. While many hosting providers offer free SSL certificate, most don’t and you’ll need to buy one separately. Installing a backup solution, enabling Web Application Firewall, changing the default admin username, disabling file editing and PHP file execution, limiting login attempts and adding security questions to WP login are some of the other measures you can take to enhance the security of your WordPress site. SEO is not a one-time activity, but a constant cycle that requires us to ensure compliance with SEO best practices and provide readers with useful content. WordPress makes it possible for even the beginners to do most of the SEO stuff without any assistance, which helps boost site traffic and enhances exposure. Experts have their own definitions and explanations of SEO, but their goal remains the same i.e. optimizing content for better search ranking and visibility. That’s why we recommend trying different approaches and seeing what works the best. The free WordPress Themes cannot be an alternate to the paid versions. The free versions usually come with very little customization features and making changes to them requires an extensive understanding of WordPress Development and coding. Rather one spends enough time to adjust these things, the simple method will be to spend a few dollars to buy the paid theme version. The few dollars spent in this way will save you from a lot of problems afterwards.